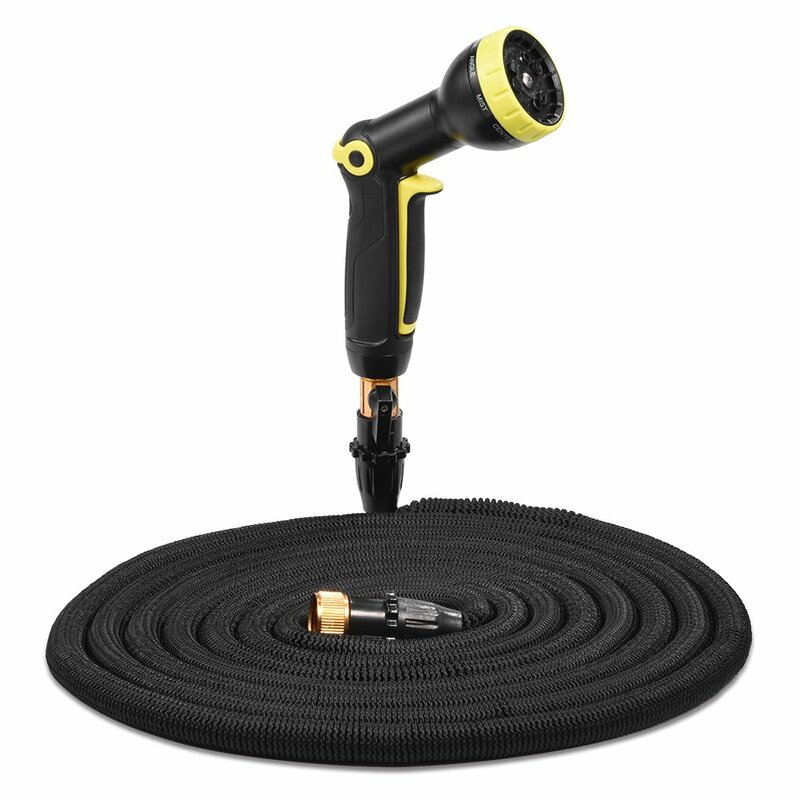 ☄ Durable & Sturdy for Lasting Using: This garden hose is made of solid 3/4”brass connectors, rubber seal, pray nozzle with 9 adjustable patterns, sturdy on/off valve, extra-flexible 3750D polyester fabric cover in 3-12 bar pressure and 41℉-113℉ temperature, which can ensure there are no rust, leak, tear, rip or crack, and they are designed to be long lasting. ☄ Flexible & Light-weight for Convenient Watering: The Expandable Hose starts from 17ft, it can become 50ft in 3-12 Bar (3 times than before) being through the water. Light fabric hose, evening being full, it is easy to carry and move around in the large yard. After water is turned off, it retracts back in seconds. So it is convenient for your watering. ☄ 9 Adjustable Patterns & Shut Off Values for Different Needs:Full, flat, shower, cone, jet, soaker, angle mist, center. Totally 9 ways allow for different water intensities. It is very useful in watering new plants which are still in pots. It includes water shut off values and also helpful to turn off the water, no need to close the tap. ☄ Compact Size for Easier Storage: The portable design make it easily packed in a storage bag, which doesn’t take too much space. When not using, please drain the water out and put it in a shady location. ☄ Multipurpose Hose: Cleaning the floors, watering our plants, Washing your pet dog and your car and more. It is designed not only for gardening but also for daily watering. It is the home helper.